Ever since we were little kids and read our first Stephen King novel (yes, our older siblings let us do that thing when our mom wasn’t watching), one of our greatest fears has been waking up in one of his backwoods towns. Luckily, that never happened to us. 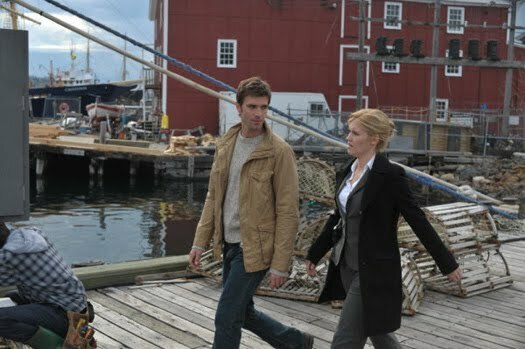 But it has happened to Emily Rose and Lucas Bryant, who star in the new series Haven, which is based on the King short story “The Colorado Ki.” Now, they wake up every day during production in the remote town of Lunenberg, Nova Scotia, where the crew makes very King-like things happen. In a recent interview they talked about their characters, Audrey Parker and Nathan Wournos, and how the town of Haven comes to life through Lunenberg. Series Creator and Executive Producer Sam Ernst chimed in. Read what they have to say and see it for yourself when Haven airs on Syfy every Friday at 10:00 PM. Q: What would you say is the major blind spot for your character and how is that going to trip your character up as the story unfolds? EMILY: That’s a great question. I would say I think the major blind spot for my character I think happens initially in the first episode with this confrontation that she comes to grips with there might be some link to her past and her family and her roots. And I think that as those start unfolding in the story it will start tripping Audrey out and tripping her up at times. I think she’s so used to having this defense and that she knows how to operate and she knows how to do her world and her day-to-day but the personal and the emotional things that she has to face, she’d rather not. So I think that’s going to be her blind sight. LUCAS: And I would say, this is Lucas Bryant playing the role of Nathan Wuornos and I just wanted to mention also that Emily didn’t mention, she has a really hard time walking. That will affect her forward momentum. But for me, Nathan has a condition where he can’t feel pain so this has alienated him from people and relationships recently and so I think that it’s intimacy that will get in his way. But at the same time that’s something that when Audrey blows into town she blows his world open. Don’t laugh, it’s true. So we’ll see if he’s able to yeah, overcome those emotional deficiencies. In some ways we’re very similar that way. Q: Emily, you’re playing a different character than in the book so would you talk about where the book ends and you begin? And also what cool super power creatures are you looking forward to facing? EMILY: The unknown. Actually when I read “The Colorado Kid” initially I had a very strong reaction to it. I threw it across the room and was like, “What? What the heck?” And then I picked it back up and Stephen King so wonderfully, in his afterward, nurses you through it and helps you digest it. And I honestly think yes… not being the Stephanie character specifically but Audrey Parker, I feel like is from this reader’s point of view, observing this town and this quirkiness that’s existing. So in a lot of ways I think that’s super beneficial that the audience observes Haven, this central character of this town through the eyes of her. And while that character may not be completely written as a person in that story it’s neat because you definitely as a reader are a character through the observation through the quirkiness that’s going on and I think that’s the part that Audrey Parker takes is the place of the audience observing and having to cope with all the strange things that are getting thrown at her. Q: Have you noticed the X-Files role reversal on Haven—Emily’s character as the Mulder character and Nathan being a little more skeptical despite his own abilities? LUCAS: Yeah, yeah, and I really fought to get Gillian Anderson’s hairstyle and color but no luck yet… I don’t know, I had. EMILY: Yeah, you definitely think of it stepping into the genre. You definitely know it’s out there. I think you know that it’s there and you know that it’s the gauntlet laid before you but you also want to make it fresh and new and its own entity in and of itself. So I think we take those archetypes and characteristics into mind but want to make sure that we’re staying true to the people that we’ve been written as and how that plays out. LUCAS: Yeah and they’re great. I mean, they’re like a beautiful classic couple and I think we’re probably the next beautiful classic couple. Q: Can you talk about working in Nova Scotia and what the town of Lunenburg gave the series creatively that Maine couldn’t? EMILY: I always say that I think that Haven, Maine of course is the central character in this show and I think that Lunenburg and Chester and all these really cool places surrounding this area, it’s just eye candy. It’s like a lot of shows go out there and they’re filmed on the same lots in the same place and you see the same streets. And this is like I think you can agree from watching the screener it’s like stuff that you don’t see out there. And doubled with the fact that we’re shooting on film and it’s very rare these days to be doing that to get the graininess of it. It really sets a tone and a place for us to play and to make these discoveries and it adds a certain weight. And Halifax, the people here and the crews here have been nice to us and really it’s a great place to be shooting. SAM: It’s an absolutely beautiful part of the world and it is a character in the show and that’s what we’re so excited about. We always saw it that way. Jim and I spent a fair amount of time in Minnesota, which… on the surface of it [has] very normal people as you would think, whatever normal means. When you get to know them you find out they’re just as freaky as everybody else and certainly that’s true in Maine and Nova Scotia. And, of course, I actually took the ferry from Maine to Nova Scotia and you don’t really feel like you’re changing cultures. It feels like it’s just a natural continuation from one group of people to the other. So it looks just like Maine, of course, and feels just like it. But everybody speaks a little funny. That’s the only difference I have found—and that’s just Lucas, of course. LUCAS: That’s mostly me and [Jerry] our sound guy. He’s from Newfoundland. SAM: Yeah, and although the crew is all, of course, local and they’re fantastic, just unbelievable to work with. Q: Well it is a short ferry ride for Stephen King so hopefully you guys get him. SAM: We’re trying man. We are so trying. Q: Could you tell us a little bit about your experiences shooting the first episode of the series and maybe some of the challenges stepping into your respective roles on the show? EMILY: Shooting way outside of Halifax. LUCAS: Yeah, not quite in civilization but exactly where we wanted to be for this because… I don’t know if you’ve traveled the south shore of Nova Scotia but it’s stunning and… it’s a landscape that you don’t often see on television. So being able to capture that on film no less is a beautiful and exciting prospect and I think we were both like strangers in a strange land for a little while when we started shooting which was a perfect place to be. LUCAS: Yep, and I mean, we got here in April and we started shooting in April and so in the scene in the pilot where Emily and I first meet each other, shooting that scene we were outside. It started off on a beautiful day and then it was black clouds and then it was pouring rain. Then we had hail and two rainbows by the end of the day. And it was all in the same scene and… I had very little faith that it would actually cut together but it does and it’s beautiful. And so we just quickly got used to that being the status quo. What you can expect during the day was everything to change every five minutes. And so that natural like chemistry and familiarity I think works between the characters because in one way Audrey doesn’t want to feel anything emotionally and then you have Nathan who can’t feel anything physically and how do those two like interplay and how do they walk that fine balance. But in a way, us working together really before helped because we have that natural we can fall into place and finish each other’s sentences. But I think for me it was also trying to I’ve been sitting with the pilot, sitting with the script for a little bit and so it’s to make each thing new and to make it oh my word, what is this new place and who is this person and what’s going on and all of that. So for me that was like the fine little teeter-totter that I had to sit on.